Each gun with 30 inch sighted damascus barrels engraved on the top rib HENRY TATHAM JUNR, 37 CHARING CROSS LONDON, finely scroll engraved barrel tang, border and scroll engraved signed back action locks, half stocked with chequered fore-end and wrist, border and foliate engraved white metal fore-end cap, border and scroll engraved steel mounts decorated with game, the wrists set with yellow metal oval escutcheon bearing the crest of Ernst Augustus, King of Hanover, brass capped wooden ramrod. London proof marks. The serial number only appears on one of the pair. Note: Ernst Augustus (1771-1851), fifth son and eighth child of King George III born at Buckingham House, Duke of Cumberland and Teviotdale (1799-1837). On his death in 1851 an inventory of his gunroom was made. 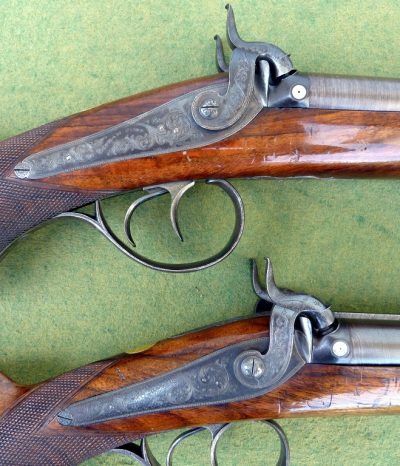 It includes a number of pieces by leading London gunmakers such as Henry Tatham, Nock, Staudenmayer and Manton.